A big recruit out of high school, Chris Childress had a major shoulder injury which cost him his first two years of college baseball. He made his debut with the College of the Albemarle for the 2014-2015 season and put up some big numbers. Unfortunately the baseball program was shut down once the season ended leaving Chris in a tough situation. He looked to transfer to another school in Ohio but his credits didn’t transfer making him ineligible. He has since been finishing up his degree online while playing summer collegiate baseball. Chris is a true utility, comfortable playing almost any position including catcher and pitcher. As a pitcher he throws a 2 seam fastball, changeup, knuckle curve and a slider. Chris hits for average with pop, as shown in 2015 when he hit .345 with a slugging percentage of .464, earning him MVP honors of Tidewater Summer League (wood bat). Unfortunately the league does not publish stats but an article on Chris from 2015 of his performance provides more than enough information to show Chris is a talented player. In 2017 Chris took up the role as hitting coach at his former high school as he finishes up his degree online. He would like to continue with his coaching overseas and is open to coaching a youth team for any club that signs him. In 2017 he signed to play in Melbourne, Australia for the winter season (U.S. summer) where he hit .455 in 33 at bats with 7 extra base hits. He also pitched 6 innings with 6 strikeouts while holding down an era of 1.50. Chris remains in Melbourne for the 2017-2018 Aussie summer (U.S. winter) to play and coach for another Melbourne club. He is open to all offers for the 2018 summer. 2017 Pitching Coach Hanover High School VHSL Worked with pitchers, called pitches, mound visits, regular assistant coach duties. 2017-18 U12 Head Coach Williamstown Wolves Set up and go through practices, write line ups, coach the kids through all areas of the game. "I played against Chris during the the Australian winter season in the Melbourne Winter Baseball League and am currently playing with Chris in the Victorian Summer Baseball League with The Williamstown Baseball Club. 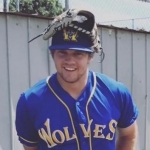 Chris is currently playing at Williamstown Baseball Club, he is our club pitching coach, as well as an under 12 junior coach Chris is a high caliber player that is going to add quality to any team he joins. Chris is definitely at his best in the batter's box. In BP the ball will regularly leave the yard. He hits often, and with power to all parts of the field. What I like most about Chris is his approach at the plate, most hitters with his power will have a high strikeout rate, although Chris' ability to battle when he's down in the count is definitely an asset to him. Since getting to Australia Chris's pitching has gone from strength to strength. Currently (October 2017) I would roughly clock his fastball in the mid to upper 70's...but I wouldn't be surprised if he is throwing in the 80's by the end of the season. He continues to improve since returning to the mound from an extended hiatus. He is comfortably throwing 3 pitches for a strike and currently work-shopping a forth. So far this season I have watched him start games, as well a relieve from the field for extended periods. As long as Chris is healthy his pitching will only get better. As far as catching, I have only seen Chris in bullpen's he has caught for me...although, from what I see, i would be comfortable throwing to him in a game. His strength would definitely be calling a solid game and managing a pitching staff. After pitching at such a high level himself, Chris just gets pitchers. As far as character goes, there are none better. Chris has become an extremely close friend of mine since he has arrived in Australia. He understands club baseball, carries himself both on and off the field with respect and dignity, he is true professional. Chris is going to be a positive influence to any club he finds himself at. When he leaves, we will be hard pressed to replace the player and person that he is." Education: Currently finishing up college degree online. If a club offered Chris a place to stay and a job, he would be willing to pay his flights. Chris is available immediately and has no obligations to return to the U.S. in the near future. 2017 Hanover High School VHSL Worked with pitchers, called pitches, mound visits, regular assistant coach duties. 2017-18 Williamstown Wolves Set up and go through practices, write line ups, coach the kids through all areas of the game.